Consumers and retailers alike hate stockouts. A recent study conducted by the Grocery Manufacturers of America reported that retailers are likely to lose almost one-half of the intended purchases when a consumer confronts an out-of-stock item. The same study found that, in response to stockouts, shoppers primarily 1) purchased products at alternate locations, or 2) delayed purchases of those products. 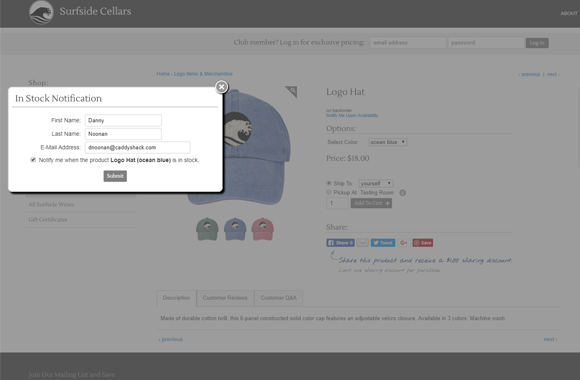 Nexternal's "Back In Stock Notification" feature is a streamlined method for communicating product status to interested customers, and keeping them engaged with your company. When viewing backordered products, shoppers have the opportunity to opt in to a real time mailing list for that product. The shopper fills out a few simple fields and as soon as the status of the desired product switches back to active, an email is automatically sent to this list of customers letting them know the product is back in stock. In your Order Management System, you can also see, at a glance, which products have long and short crowds of shoppers awaiting notification. This data may also be exported into Excel or Access. If you are interested in learning more about how your company can utilize Nexternal's Back In Stock Notification Feature, please call 888-430-4489.